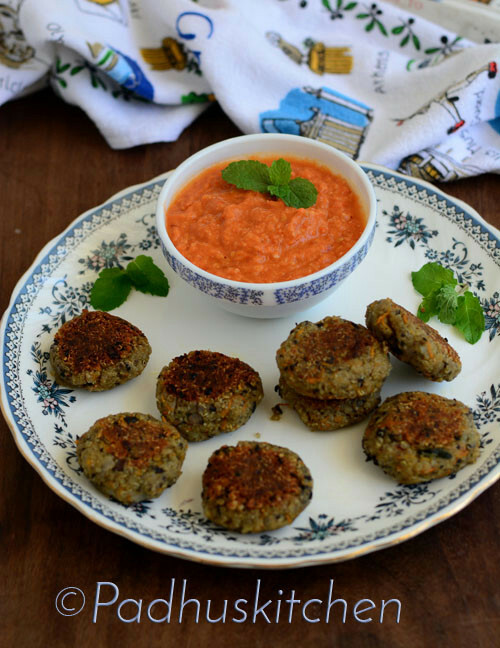 Quinoa Beans cutlets or tikkis are packed with nutrient rich black turtle beans, quinoa and vegetables. It can be had as a snack or even for breakfast or dinner. It is vegan friendly and also great for weight loss. Both quinoa and black beans are powerhouse of nutrition. Today we will learn how to make quinoa black beans vegetable cutlet following this easy recipe with step wise pictures. Cook quinoa as given in How to cook quinoa? Leave it to cool. If using dried black beans, soak it overnight and pressure cook until soft. Drain the water, mash it and keep it aside. Heat 2 tsp of oil in a pan, add onions and fry until transparent. Add ginger garlic paste and saute for a few more minutes. Add chilli powder, cumin powder, salt needed and cook for a few more minutes. Remove from heat and leave it to cool. In a bowl, mix together cooked quinoa, cooked and mashed black beans. Add sauteed onion mixture, mashed potato, oats powder (just powder oats to make oats flour), grated carrot and mix well. Add salt to taste. You can add any dry herbs if preferred but not necessary. Mix well and bring it together to form a dough. Divide the mixture into equal parts and make smooth balls out of it. Then flatten the balls to form patties as shown in the picture below. (Note - you can freeze these patties at this stage, if you want to make it a day later. Bring it to room temperature before frying). Heat oil (around 1-2 tsp per patties) in a tawa and fry the patties on low heat until golden brown on both sides. Enjoy it hot with green chutney. It goes best with green chutney. As I was not in a mood to make green chutney, we had it with leftover onion tomato chutney. Check out more Quinoa Recipes. If you don't have oats, can you substitute something else? You can substitute bread crumbs. It is a great recipe! I was a little misled by the prep time. It does take longer than 20 min to make this.